Recently, all in the same evening, I helped my teenage daughter get ready for her first Homecoming dance and read Spiderman to my 4-year-old son, Micah. Raising four kids whose ages span a decade has given me an interesting—and a shifting—perspective on motherhood. With our youngest I’ve realized that being “late” to potty-train isn’t the end of the world (as my pediatrician says, “I promise you he won’t wear a pull-up to prom”), and it’s not essential to have him reading by age three. With my oldest I’d been the typically over-zealous, type-A parent, determined that a french fry would not touch her lips the first three years of life. I’ve now relaxed to a type-C parent—I think Micah was eating chicken nuggets and fries as soon as he could chew. Throughout marriage, ministry, and family life, I’ve experienced much joy and blessing, but also heartache. I entered adult life with rose-colored glasses on, thinking everything would work out exactly as I planned. I didn’t anticipate the trials of loneliness, miscarriage, ministry conflict, deferred hopes, and the sheer exhaustion and responsibilities of daily life. Being in ministry has also allowed me to walk through seasons of suffering with others. I’ve been near to friends who’ve experienced depression, infertility, death of loved ones, broken relationships, marriage conflict, and more. Difficulty and suffering fill our lives, yet our hope and joy is found by looking to Jesus for our contentment, rather than ideal circumstances. I pray that my writing will point others to find their satisfaction in Christ instead of whatever else they think might fill that void. A couple years ago I was in a weekly Bible study that was focusing on the life of Moses and the Israelites’ journey through the wilderness. At the time I was walking down my own dark path, but I felt incredibly encouraged and comforted as I studied the truths of God’s Word. I saw parallels between the Israelites’ discontentment and my own. I was convicted of my lack of gratitude for God’s blessings as I read about the Israelites’ constant whining. I also was given fresh motivation to persevere through difficulty as I saw Moses continue on his rocky path of leadership. Around that time I started writing blog posts for various ministries about things I was learning. As those lessons began to accumulate, I began thinking that I could likely write a small book on this section of Scripture. 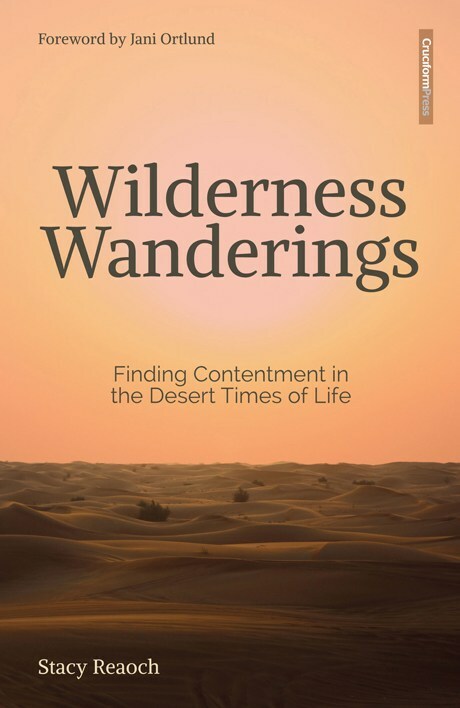 Another impetus in writing Wilderness Wanderings was to provide a short, chronological devotional for women who feel too busy to commit to a lengthy inductive study. I’m passionate about Bible study, mostly because I’ve seen it as the primary means God has used to sanctify me and grow my faith. But I also realize that there are seasons of life where it’s difficult to get to a weekly study or commit to one with a lot of homework. I have friends who feel like they’re drowning in piles of laundry and don’t have time (or energy) for an in-depth study. My hope in writing Wilderness Wanderings is that women with a small amount of time could still benefit from a chronological study, whether it be on her lunch break at work or waiting in the carpool line at school. I also hope that others will recognize the relevance of the Old Testament to our lives today. Studies for women often focus on New Testament passages. But God has much to say to us through the richness of His entire Word. As a side note, writing with four children in our home is a balancing act. The majority of this book was written during two-hour blocks of time I had a couple mornings each week when our youngest was at preschool and my older three were at school. I’d race home from preschool drop-off, pray for the Lord’s blessing on my time and writing, and get to work! I’m continually learning new ways to be efficient, like hiding my phone during those couple hours I have to write so that I won’t be distracted by social media, or running to the glamorous Target café while my daughter is at her gymnastics class to squeeze in one more hour of writing. Although I’m not wishing away the time my youngest is home with me (reading stories to him after lunch is my favorite part of the day), it’s exciting to imagine a day in the next couple years when I’ll have several hours in a row to write!